Typhoon (TY) 06w (Tapah), is located approximately 457 nm southeast of Iwo To, and is tracking north-northwestward at 06 knots. USA – More thunderstorms, flash floods and wind gusts are expected to hit the US East Coast – just as thousands try to recover from the damage wreaked by twisters. Tornadoes may take place in Virginia, North Carolina, South Carolina, and Georgia. 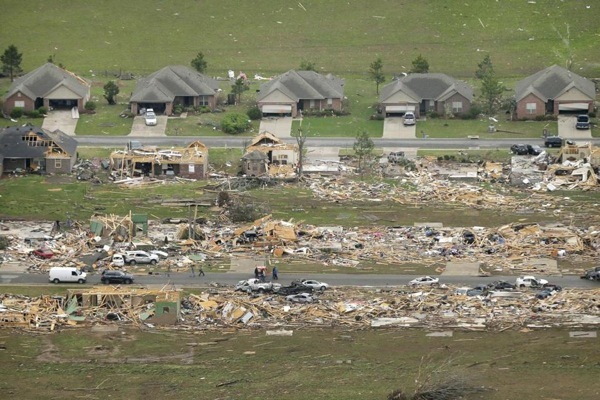 A day after a half-mile-wide tornado carved an 80-mile path of destruction through the suburbs of Little Rock, Ark., more tornadoes flattened homes and businesses, flipped trucks over on highways, and bent telephone poles into 45-degree angles as they barrelled through the South on Monday. The death toll now stands at 34. Tens of thousands of customers were without power in Alabama, Kentucky, and Mississippi, and thousands more hunkered down in basements and shelters as the National Weather Service issued watches and warnings for more tornadoes throughout the night in Alabama. The system is the latest onslaught of severe weather after at least 15 people were killed in Arkansas on Sunday. Tornadoes also killed one person each in Oklahoma and Iowa on Sunday. As of 18:00 on 26 April 2014, the Ministry of Health (MOH) of Guinea has reported a cumulative total of 224 clinical cases of Ebola Virus Disease (EVD), including 143 deaths. To date, 202 patients have been tested for ebolavirus infection and 121 cases have been laboratory confirmed, including 74 deaths. In addition, 41 cases (34 deaths) meet the probable case definition for EVD and 62 cases (35 deaths) are classified as suspected cases. A revised number of 25 health care workers (HCW) have been affected (19 confirmed), with 16 deaths (12 confirmed); the number of HCW was previously reported as 26.